On July 5, Immigration, Refugees and Citizenship Canada announced a consultation with Canadians on the future of our immigration system. As part of the consultation, all Canadians have until Aug. 5 to send in their thoughts on what our immigration system should look like. From my point of view, the way to ensure that our immigration system meets the needs of Canada is to put the focus on recruiting the most talented economic immigrants. While Canada must continue to accept refugees and family immigrants, our immigration system must prioritize developing a workforce that will meet the economic and demographic challenges of 21st century Canada. In order to do this, 75 per cent of all immigrants to Canada must be economic immigrants. Of this, the vast majority should be individuals chosen by employers, not government. Immigrants who come here without job offers here should not be our focus. One way to accomplish this goal is to convert the temporary foreign worker program into a preliminary permanent resident program. While temporary foreign workers can become permanent residents, the process for doing this is clunky. Making the temporary foreign worker program the first step to permanent residency would show recognition that foreigners selected by Canadian employers are the most successful immigrants. 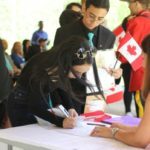 One reason the focus should be on immigrants with jobs in Canada is that when immigrants come to Canada without jobs, taxpayer-funded services are needed to help them find jobs and acquire language abilities. By focusing the immigration system on people with job offers, immigrant services can be focused on the those who need them most — refugees and family immigrants. The current system of government choosing immigrants by awarding points for age, education, language and work experience is outdated. A high score does not guarantee a person will get a job here. Having temporary foreign workers go through this point system after they have successfully lived and worked here does not serve anyone well. When temporary foreign workers are chosen to work in Canada, their educational credentials, language abilities and work experience are assessed by their employer. When they apply for permission to work here, the federal government is supposed to make sure they meet the job requirements. Why then does the federal government require temporary workers to prove their education, language ability and work experience a second time? If a Canadian has employed a temporary foreign worker for one or two years in Canada, proving their credentials again is not necessary. This is a waste of time and money. Temporary foreign worker should automatically get permanent residency after working one or two years here, pending only background checks. This brings me to another point. Currently, not all temporary foreign workers have a pathway to permanent residency. Under the current system, only so-called high-skilled workers have a clear path to permanent residency. So-called low-skilled workers can only immigrate here if they work in certain provinces. This must change. Once a high-skilled temporary foreign worker has worked in Canada for one year and a low-skilled temporary foreign worker has worked here for two years, they should immediately be eligible for permanent residency. Why the difference in years? Employers generally must prove there are no Canadians available to do their jobs each year, so this makes the requirements stricter for the low-skilled employee. In addition to simplifying permanent residency for temporary foreign workers, the federal government must work with business to actively recruit immigrants to Canada. Canada competes for the world’s best and brightest with Australia, Europe, the U.S. and other countries. As China, India and the Philippines continue to develop, it is likely immigration from these countries will shrink. In recent years, some Chinese and Indian immigrants have returned home because of economic opportunities. It is only a matter of time until these countries start actively recruiting Canadians. While the government has done some recruiting of skilled workers, the red tape associated with the temporary foreign worker program puts it only within the reach of larger companies. While, theoretically, small- and medium-size companies can avail themselves of the temporary foreign worker program, most of the byzantine procedures put in place by the government effectively scare many of these companies away. While the main focus of Canada’s immigration strategy should be on economic immigrants, family immigrants and refugees should continue to come in large numbers. While Canada should set aside 75 per cent of its spots for economic immigrants, increasing the total number of immigrants to Canada will also increase the number of these immigrants.